I have looked at many of the avocado dressed pasta’s that you see floating around. They all look so delicious I knew I had to make my own version. Since I feel that capers ‘jooshes’ up a dish and I just love the little buds so much, there was no question about adding them. 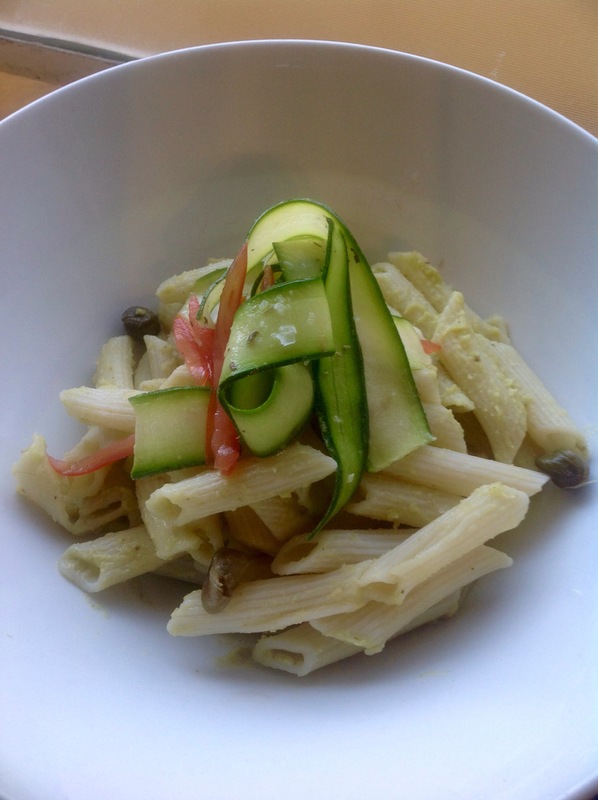 So without further ado, here’s my Avocado and Caper Pasta for a very comfortable Saturday night. Sauté the onions until golden, adding the garlic and capers to soften. Set aside. Once cool, add in the avocado, juice of 1/2 a lemon, salt and pepper and a splash of caper brine to taste. Blitz using a food processor or hand blender. I prefer using a hand blender as it offers far less equipment to clean when you’re done. 1/2 a packet of Penne pasta, cooked as normal, and kept hot. Stir the avocado sauce through the warm pasta. Serve up and garnish with a salad of raw courgette and tomato in a zesty lemon oregano marinade. Mix together with 1 tablespoon of olive oil, a squeeze of lemon , the juice of the tomato and 1/2 a teaspoon of dried oregano (fresh is of course much better if you have it).